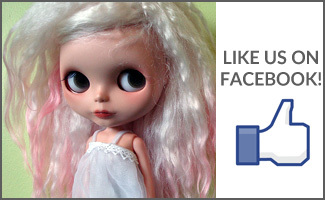 BlytheLife.com » Interview with Pauleen of Sweet Serendipity & Giveaway! To kick off the 2014 March Talent Showcase, we’re starting off with an interview with Pauleen of Simply Sweet Creations and Sweet Serendipity! Hi Pauleen! What can you tell us about yourself? I am a 26-year-old bohemian living in Mexico City, who has a degree in Computer Science but whose life’s dream is to become a film director and published author. Currently, I’m working as a freelance, self-employed, and self-taught visual artist and crafter. 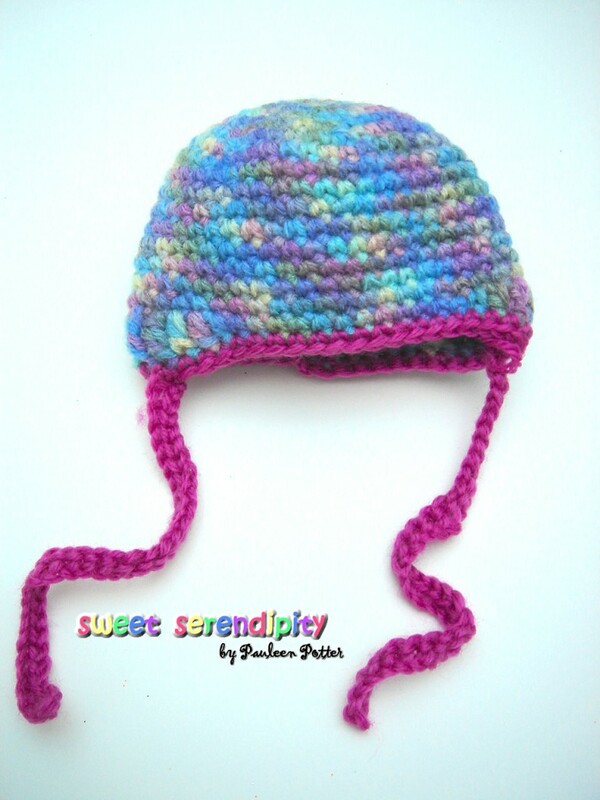 I manage 2 online stores: “Simply Sweet Creations” is where I sell my original artwork, and “Sweet Serendipity” is where I offer I wide array of handmade items and gifts. 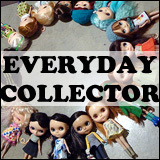 I consider myself as an obsessive collector, dolls being my most recent passion. I’m also a girl of multiple talents and innumerable interests, an avid traveller, a bit of a technology geek, and a huge, huge fan of Japanese culture. Everyone finds Blythe a little differently. How did you discover Blythe? It all began back in 2009. I wanted to enter a contest organised by a local radio station and in order to do so, you had to open an account in their site. Once I did, another member’s profile picture caught my attention. It was of a very pretty doll. 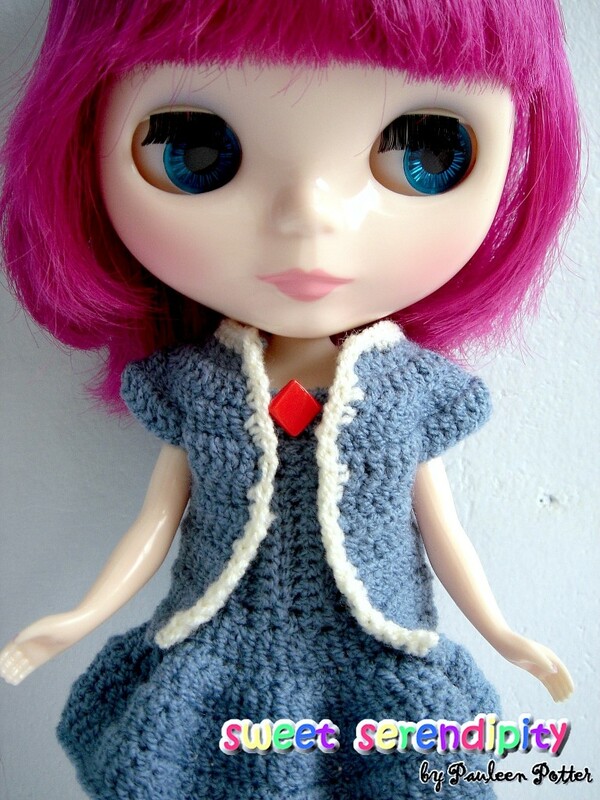 So, I checked that member’s information and lucky me, I found she was part of a group that liked “Blythe dolls”. That was all the information I required to start my search on Google and boy did I love what I found. First, I visited the official site and went through all the info there and the pics and the more I read, the more I fell in love with Blythe and my desire of owning one increased by the minute. Then, the obvious next step was to purchase one, but for some reason, in those days the JunieMoon online shop didn’t ship to Mexico. I felt a bit disappointed. Time passed, but the wish of having a Blythe doll never vanished. Finally, the opportunity presented itself in a very, very, very wonderful yet unusual way: in September 2010, I won a trip to Japan and the first thing that came to my mind was: “I’m getting my Blythe!!!”. And the rest is history, well not quite. Once in Tokyo, I went looking for the JunieMoon store in Daikanyama but nobody could tell me how to get there. I also knew the dolls could also be found at the Kiddyland chain of toy stores, but the one I found was closed because they were moving. Yet I was not ready to give up, I wasn’t going back home empty-handed and so, after getting lost in city and with the assistance of my Japanese speaking sister, we arrived at JunieMoon and OMG, that store is a dream! And yes, now the rest is history. When did your shop open and what made you decide to start selling things to the doll community? 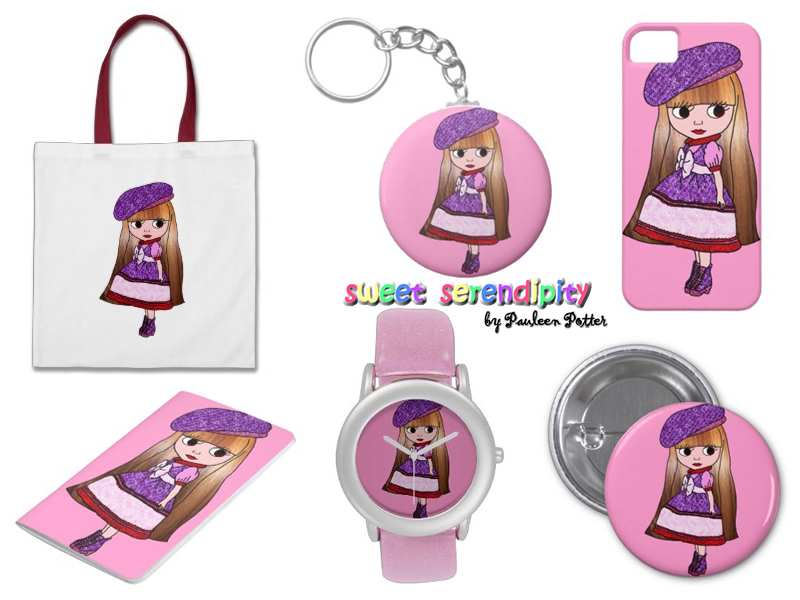 I opened my “Sweet Serendipity” shop at Storenvy in 2012, but the doll clothes and accessories line wasn’t included ’til mid 2013. I decided to add that particular category for 3 main reasons: a) During the 2013 March Talent Showcase I was the lucky winner of the most beautiful turquoise dress by BlytheStar and was pretty much inspired Lyndell’s work, so I felt it it was time for me to give something back to the community. b) I’m a fairly new crocheter and I learned how to crochet by making amigurumi. Then my knowledge of the craft came to a point where I was confident enough to move on to clothes where an exact gauge is needed, otherwise the garment won’t fit. c) Finally because no matter how many fashion designs I’ve got in my mind, I don’t have the patience to make them for humans, so dolls were the way to go. What is the first item that you created with the intention to sell, rather than to keep for yourself? A lot of thinking and preparation goes into determining what kind of products I’m going to offer next in my store and the blue dress with the matching short sleeve cardigan that my Blythe is wearing in one of the pictures was my very first sellable doll item. But it wasn’t always like that. A couple of months before I decided to sell doll clothes, I had crocheted the cardigan just to test out the pattern. Then that piece went into my PHD box (“Projects-Half-Done”) because even though the pattern turned out to be OK, at the time I didn’t know what else to do with it. After getting my BlytheStar’s prize in the mail, I finally had the epiphany of how I could complete the outfit. When I finished the dress and “asked” my Blythe to kindly model it for me, the whole ensemble made sense and that’s when I knew I was ready to offer it online. Where do you find inspiration for your crocheted designs? Inspiration comes from everyday life and I always have to make sure to be prepared with pen and paper whenever an idea hits me. Yet for crochet, especially doll clothes, inspiration comes mostly from myself and from my own particular sense of style. You see, I’m an extremely girly girl, I only wear dresses and skirts. So in terms of fashion, I always design outfits that fit my taste and that in a way, remind me of the beautiful garments I used to wear as a little kid. Also, I have this habit of buying craft materials and yarn without a project in mind, because when it comes to creating something from scratch, I like a challenge and what better way to put my imagination to work, than with a table full of ordinary items waiting to be turned into extraordinary masterpieces. How has your involvement in the doll community changed following selling doll clothes? It has changed in oh so many ways. For starters, when I first entered the doll world, I was a mere collector sharing pics of my dolls. Now, as a newly seller of doll fashions, it makes me happy to offer something more tangible that will be much more appreciated and perhaps more useful than a single image of my whimsical collection. Furthermore, whenever someone asks about my dolls’ outfits, it feels nice to say: “Yes, I made it myself” or if in a doll-related forum or site I come across the post from someone looking for clothes for Blythe or any other doll, I can gladly reply: “Here’s a sample of my work, hope you find something you like”. In addition, I recently began receiving tutorial requests for a couple of doll accessories I had made just as an experiment . Finally, I myself have introduced a couple of girls into the doll world after quite almost literally mesmerizing them with my very own and ever-growing doll collection. Tell us a little bit about your first sale: what you sold and how you felt about it. My first doll-related sale was crazy and it didn’t even take place at my online store. Here’s how the story went: I had this Facebook contact, it was precisely one of those girls I mentioned before, the ones I introduced to the doll collecting hobby. Well, this particular girl had just bought her first doll and she was eager to expand her outfit choices, so she wrote to me. 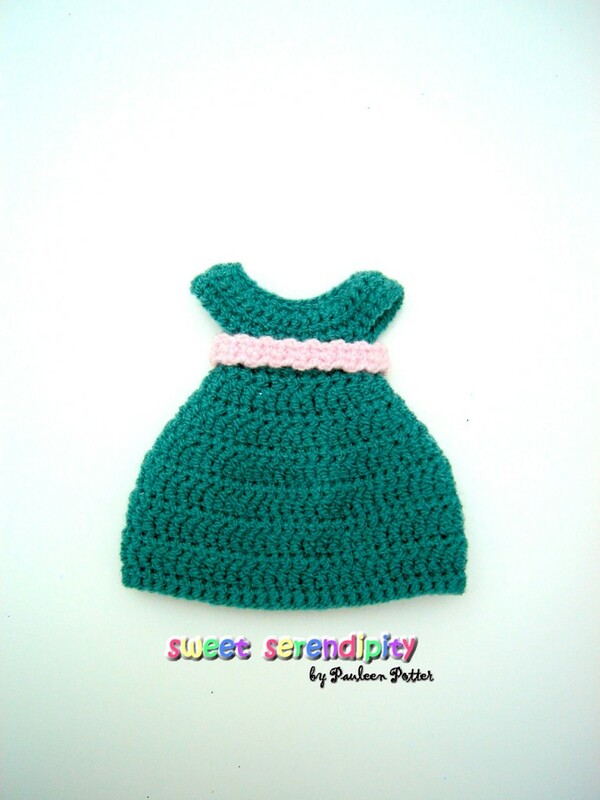 She would begin with a dress, but not one from my catalog, she wanted a custom order, a piece that was one-of-a-kind and that would suit her doll’s personality. I presented her with a couple of options I had at the moment, but she was indecisive. Next thing I know, she makes a deposit into my bank account and later tells me: “Forget about the dress, what I really want right now is a plush toy to keep my doll company. So, with the money I paid you, what amigurumi can you make, shipping included”? I was in awe. In the end, I sent her a tiny cupcake amigurumi and from the reaction I got, I can say she was thrilled and I was very flattered. This girl was so excited when she got the package, that she made and shared a video of all the unwrapping process, bragged about her new acquisition, and encouraged people to buy from my store. What would you say is the most valuable tool that you use for your crafting? My imagination and my hands, no doubt about it. Without them I wouldn’t be able to do anything. I see my imagination as this computer continually generating new ideas and my hands as the 3D printer bringing those ideas to life. Any other utensil or instrument, like crochet hooks, needles, scissors, looms,… are just helpers in the whole creative process. What would you say has been the hardest lesson you’ve learned so far with being crafter who sells things? Don’t bite off more than you can chew. When I started with the whole “selling-my-work-thing”, I resorted to the Internet to sell and promote my creations. Nonetheless, as useful as the Internet may be, it is also a risky business and it can take you off the track in an instant. At the beginning, I was listing my handmade items in multiple online stores and had opened accounts in all major social networks. Soon, I was so busy in keeping all this sites functional and updated, that my crafting time was severely affected. The result: no new products to offer and absolutely no increase in sales. The moral of the story: it’s okay to use the Internet for marketing purposes, just don’t exaggerate. 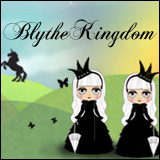 Can you give us some ideas of what’s in store for you and your Blythe endeavors in the future? Expect to see more crocheted outfits as well as a wider array of accessories such as jewellery, bags, and hairbands. Also, one of my New Year’s resolutions was to learn new crafting skills, so there may be some mixed-media creations down the road. Then, in a far more distant future, I’m planning a line of doll furniture and perhaps wigs, if all goes well. In addition, I intend to include fashions for Middies and Petites. Finally, I’ve got some nice treats in store not for Blythe dolls, but for Blythe owners and it goes as follows: If you want to showcase your love for Blythe, or you need little trinkets to give out as free gifts on orders placed by your customers, or if you just want to advertise your brand in conventions and meetings, then I’m offering a special service of designing/manufacturing some really unique products to fulfill those needs. This service is already available and I’ve tested it on myself. I never miss an opportunity to wear my brand t-shirts when going out to crowded places. Thank you so much for participating in the March Talent Showcase this year, Pauleen! What kind of advice would you give someone who’s new to running an online business? Well, thank you very much to you Michelle for having me, it’s been a great honour. Now, on to the advise. I have three basic rules when it comes to running an online business. First and foremost, your store policies and product descriptions should be clear, detailed, and truthful because should anything go wrong with a sale, you have written evidence to back you up and protect you as a seller. Second, if you offer custom orders, remember that you are not a mind reader, so I recommend creating a guideline or a template for the information you require your customer to provide so that you’re able to translate their wishes into the product of their desire. And third, yes there are mean people out there who seem to have nothing better to do than to leave rude comments on your site. I say: remove that rubbish and be prepared to stand up for your work. A lot of effort goes into handmade and in being your own boss, and no one has the right to minimise or disapprove that. You can find out more about Pauleen from her blog, on Facebook and at her shop! 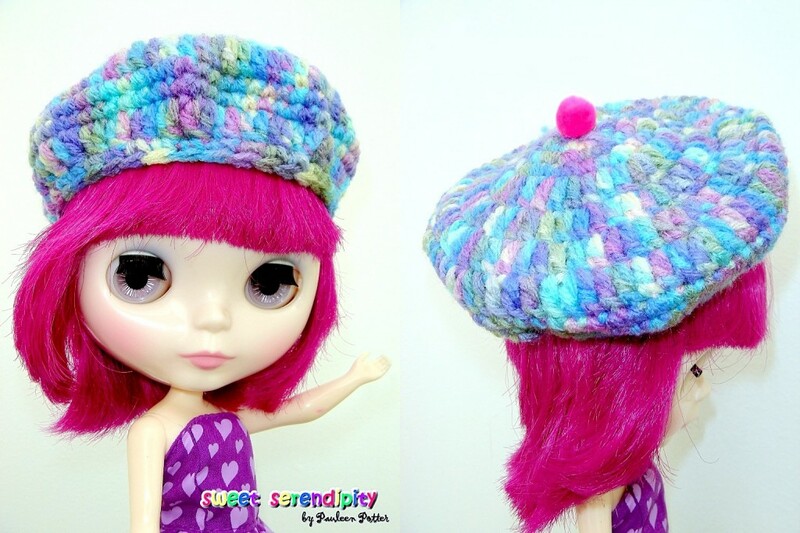 Pauleen has generously decided to giveaway one crocheted beret to one lucky reader here on BlytheLife! What a darling little pom pom on top! The giveaway runs until Saturday March 15th 2014 at 11:59pm Pacific. The draw will be held on Sunday March 16th 2014 and the winner will be announced on BlytheLife.com. Remember to use a valid email address for all comments. If you win, your email will be forwarded to Pauleen so she can get in contact with you regarding sending you the prize. First of all, Congratulations Pauleen!!! It’s amazing everthing you do. You’ve inspired me to follow my dreams. It’d be awesome to win the beret. I really enjoy reading about other Blythe enthusiasts – I especially enjoyed reading about how sheer determination got you to Junie Moon!. 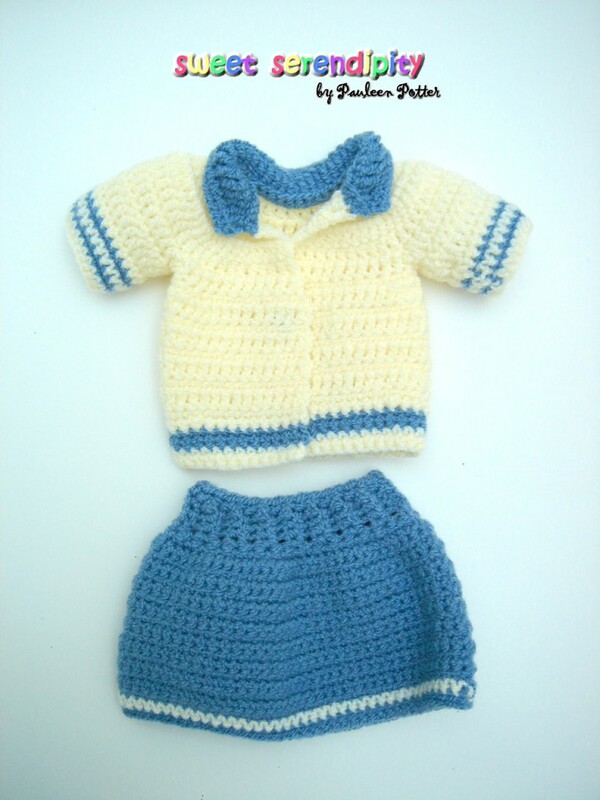 I do like your crocheted designs – they’re beautifully detailed. Thank you for the chance. Adorable items Pauleen! Also great tips about running a business online. I enjoyed reading your interview and thanks for the chance to win your cute beret!